Arsenic Water Test Kit 481396-5 5 tests $15! 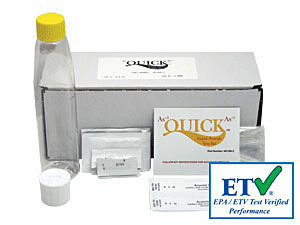 Arsenic Quick test Mini-Kit detects 5 ppb (μg/L) of arsenic in 12 minutes. Test kit contains 5 patented test kits to detect Inorganic Arsenic (III & V) in water. Our easy to follow test procedure requires only three reagents and takes almost no time to perform. No other chemicals are required, safe and easy to use. Test can be conducted at home or in the field. Performance and accuracy of the kit have been verified by the USEPA through the ETV program (www.epa.gov/etv). No dangerous chemicals needed to run this kit. Test detects presence of organic Arsenic III As(III), and inorganic Arsenic V As(V) in drinking water. Can also be used to check for levels of arsenic in soil. If you need to detect lower levels of arsenic in water, have a look at our Arsenic Quick II Test Kit for lower detection ranges. or 0, 5 , 10, 20, 60, 100, 300, 500, >500 ppb (parts per billion). Q: I followed instructions, but can't reach water in the bottle with a test strip. A: You are not supposed to, if you do it ruins the strip. Test strip will react with a gas that forms in the bottle above water sample.